Eurocopter EC135 is the one which looks like an imaginary and also made with the futuristic bird. It comes with the prominent brown throat and a long tail. The interior of this helicopter is done by the famous brand called Hermes which comes with the invisible stitching and impeccable lining as well which provides it much class. It is made with two powerful turbo engines and has a large range of 635 kilometers. The estimated price of this helicopter is almost $4.2 million. The Eurocopter EC145 is a multi-role helicopter. 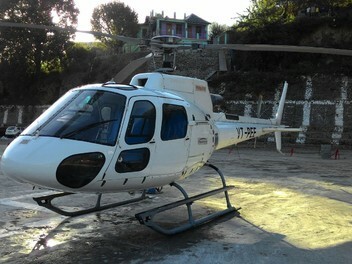 It is made in a medium size which is considered as the best size in helicopters and has twin engine in it. It is also enhanced with the rotor blades to produce less noise and even vibration. The Eurocopter EC145 can carry almost 11 passengers in it which has high seating capacity. It comes with the maximum range of 680 kilometers and can go to at the rate of 1600 feet in each second. The estimated value of this helicopter is $5.5 million. AgustaWestland AW109 is very lightweight helicopter which is made with the twin turbo engine and was made by the collaboration of Italian and British company. It was introduced in 1971, but the formal introduction was done in 1976. AgustaWestland AW109 is used by different armed forces as well which includes Swiss Air Rescue, Royal New Zealand Air Force, and Italian Army are its big users. It is mainly used for purposes for includes rescue operations, transport, medical use and military purposes as well and is sold at the price of $6.3 million. Eurocopter EC175 is the helicopter which has the estimated value of $7.9 million and was launched in 2008 but was certified in 2011. It was designed for the civilian use and also for the support of oil and gas industry and transportation purposes as well. It is equipped with the digital engine control system and rotor with 5 blades which is a much new invention in the technology of helicopters. Eurocopter EC155 is a long-range passenger transport helicopter which is sold at the price of $10 million. It is a twin engine which can fit almost 13 passengers in it excluding the pilot. It is designed for the offshore support and the transport. Eurocopter EC155 is enhanced with the dual channel, and its whole cockpit is made up of glass and also equipped with the latest digital control system. Sikorsky S-76C is another medium size helicopter which is used for commercial basis. It was made and used by the Royal Family of Britain and also by the famous personality called Donald Trump. It is used for different airlines, hospitals, corporations and even by the government purposes. The landing gear of this plane is retractable, and rotors have 4 blades. It is the helicopter which is sold at the price of $12.95 million which is very expensive one. AgustaWestland AW139 is a medium size helicopter which is also made with the twin turbo engines and is sold at the price of $14.5 million. It is the invention of the company which is named as the company for making the most influential products for all around the world. AgustaWestland AW139 is used for the civilian use and also listed in military helicopters. It has a rotor which has 5 blades in it and can carry almost 15 passengers in it and is much spacious helicopter ever made. Bell 525 is the latest helicopter which is the new invention of the company called Bell Helicopters. It is medium sized and is made from the best composition of the metal. Bell 525 is made with twin turbo engine and can carry 16 passengers in it and the maximum range of its coverage of 741 kilometers. It is very stylish in design, and the estimated price of this helicopter is almost $15 million. Sikorsky S92 is also another amazing medium sized helicopter. This helicopter is made with twin engine and is used by the military. It has a complete aluminum frame which also has some composite components in it. The rotor of this helicopter has 4 blades to reduce the vibration and noise of it. Almost all the parts of this helicopter are made of pure titanium. The value of this helicopter is $17 million which is very expensive one. AgustaWestland AW101 is a medium size helicopter which was made by the collaboration of Italian and Britain chopper manufacturing company. It is used by the rich personalities of countries like India and Saudi Arabia. It is mainly used for the anti-submarine warfare and also as transport. The main forces also used this helicopter which includes Royal Danish air force, Royal Air-force, Royal Navy and Italian Navy as well. It comes with the estimated value of $21 million which makes it the most expensive helicopter of the world. The above ranking of top 10 most expensive helicopters is given according to the value of these helicopters. All these helicopters are made by the best companies. These have new features and large capacity for the passengers as well. These helicopters are used for different purposes and mainly by the military forces of different countries.